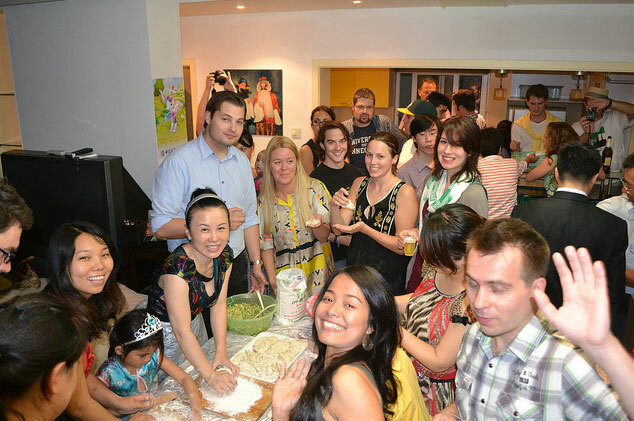 Home » News » Another Awesome Dumpling Making Party with easyMandarin Shanghai Chinese School! The 6th annual easyMandarin dumpling party was a huge success with nearly 50 students and friends coming to the school to experience a taste of Chinese culture. Students learned how to make yummy Chinese dumplings (? ?, pronounced “Jiaozi”) on June 29, 2011. Mei Hastuti, a student from Indonesia taking the Summer Intensive Mandarin course said, “It was great because I learned to make dumplings!It was cool to see so many people from all over the world…and the dumplings tasted very good!